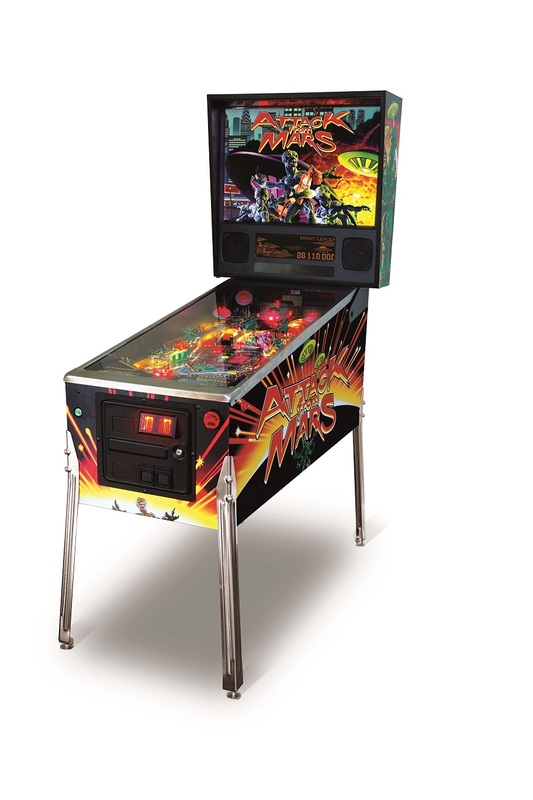 Chicago Gaming and Planetary Pinball are pleased to present Attack from Mars, the highly anticipated second game in a series of remakes of the greatest Bally and Williams pinball machines. Recreated to exceed the high standards of the original game, Attack from Mars will be available in three models: the Classic Edition, the Special Edition and the Limited Edition. These three models all have numerous features never before available and exclusive to the remakes. Modern electronics have been engineered to improve reliability, simplify serviceability, reduce energy consumption and provide game owners with the ability to customize their own game. The game's cabinetry has been greatly improved. Both the cabinet and backbox are manufactured with melamine clad plywood. Melamine is 10 times more scratch resistant than traditional lacquer finishes. The original fiberboard cabinet bottom has been replaced with a ½" plywood bottom - significantly improving the strength of the cabinet and providing added protection for the cashbox.